I'm a sucker for a classic point-and-click adventure game. The LucasArts adventures of the early 1990s are how I fell in love with gaming, and to this day remain the biggest influence on my taste in digital worlds. So whenever I see a new entry in the genre appear, I have to jump on it. The most recent to catch my attention is The Journey Down, from Sweden-based indie dev team Skygoblin. The Journey Down is billed as chapter one in an episodic saga following the adventures of Bwana and company. Bwana is, as we so often find, a regular guy who, due to nefarious plot circumstances, gets thrown into events beyond his control and needs to puzzle through them. It begins as an island noir, a frenetic jazz soundtrack backing the heavy-handed opening prologue. Mobster-styled heavies are looking for a Guy who has a Thing (in this case a book), for their mysterious Boss. The score settles into an easy reggae as we zoom in on Bwana and Kito at their boat refueling station. The power's been cut, because they're broke, and so begin the puzzles. Then in walks a lovely woman seeking the book from the prologue, and the adventure is a go. 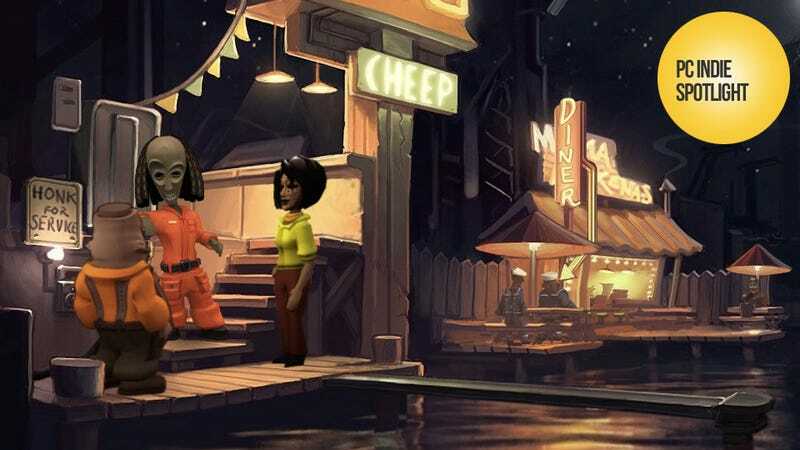 The Journey Down, from then on out, really is a classic point-and-click adventure in the vein or a LucasArts or Telltale title, for good and ill. The genre, as much as I adore it, has some rather ridiculous conventions and the game lampshades some of them, through good-natured dialog. There's a ladder in the office, but its rungs are missing because that's how we got a puzzle in they were burned for firewood last year. "For some reason, it felt like a good idea," Bwana muses. The same office has a blue mug on the desk. It's Bwana's favorite item, but "not something I feel like carrying around for no good reason." The game eases the player into its puzzles, starting simple ("open this box and pull the switch inside" simple) before meandering off into the kind of ridiculousness you expect from a comic adventure game. Need a propeller? Take this ceiling fan! But to get the fan, you'll need the fishing rod, and to get the fishing rod, you'll need the cheese, because that's the way these things go. The game text drops a reasonable number of clues to its puzzles, along the way, but there always comes a time when you simply get stuck. The old standby solution applies here: when you don't know what to do, move methodically through every single location you can visit and make sure you've collected or interacted with every single thing that there is to find. Occasionally it can become a bit of a pixel-hunt, but item hotspots are generally well-enough defined that there's no agonizing process of sweeping your mouse across every square inch of the screen, hunting for that thing that the walkthrough said was there but that you've never found. Finally, I would be remiss if I didn't mention that it's a delightful change of pace to play a game set in a world that is primarily filled with characters of color. Some of the theoretically-Jamaican accents in the voice acting are a bit dodgy, but the Afro-Caribbean setting is one that's very rarely used in video games, and comes with a great palette of colors and art to pull from. Our fictional Caribbean island bursts with color and cartoonish menace, the perfect setting for an adventure. Hopefully, the adventure's second chapter won't be too long in coming.